I was reluctant to review this film and feel I watched it at an inappropriate time, due to the current news headlines, but at the same time, feel that it is honest in that: I did just watch it and it does touch on many things that feel very important at the moment. I’ve not read the book that this film is based on, though I’ve heard great things. Many fans of the book, judging off of random posts here and Netflix reviews (I should stop reading these as they kill what little spirit I have left) that the film takes a drastically different approach to conveying the same story. I am to understand that the novel is compiled of letters, similar to the structure of Stoker’s Dracula (fitting, as this really is a horror story, just a far more striking and less silly one). The film however, exists in a temporal purgatory where scenes bleed into each other like the hazy memory of it’s depressed, dazed protagonist. This structure both gives it a distinct feel and look, with the cinematography often emulating the emotion of remembering such an event (the camera trembles with sadness in remembering the good times). The subject matter is not for the faint of heart. It deals wholly with the pain, depression, horror, and guilt that comes from raising a son that commits a spree killing. It would be easy to criticize the film for demonizing it’s boy, but I feel that the very structure of floating through memories and reality at the same time aid greatly in removing that. We are, after all, viewing everything through the pure clarity of hindsight. All of these moments that build upon each other, we, like the protagonist can now view in a menacing light that makes the outcome seem inevitable. But this is simply the memories where it makes sense now. We are not getting a “full story” but rather one dictated by the horrendous acts of our titular character so we view him as nigh monstrous through and through. This can also be problematic for many on a psychological level. I find this understandable as we crave answers. Right now on this forum we’ll find people asking whether the Nolan films caused this current spree killing, wondering if he was inspired by the Joker, or a want for media attention, or so many other things just as we as a society wondered if the Columbine kids did it because they were bullied, played violent video games, or listened to Marilyn Manson. The film however side steps these claims, if not outright dismisses them. It becomes infinitely harder to place “why” Kevin is and that is the point. Do we blame his Robin Hood obsession? His lack of punishment from a parent? Genetics? It becomes troublesome to do so for a multitude of reasons. The first is that he has a sister. She demonstrates none of his negative proclivities (though, as I mentioned early, this is but a memory so perhaps she is glorified), so genetics are hard to blame, though the film purposely gives him similar hair to his mother and casts an actor as androgynous as Swinton to play her son, implying he is more closely linked to her. Then when we look at the punishment angle, it is impossible to say whether a “spanking” would have made a difference. There are many kids who have never been spanked and do not murder their classmates, just as there are those that have experience corporal punishment and commit heinous crimes *cough*Hitler*cough*. This ties directly to the real issues at hand: Many people play video games, watch batman movies, get picked on, have bad parents, and most of them, nigh all of them, do not go on kill crazy rampages. This is what makes Kevin and all of these real people so perplexing, yet so scary. We cannot and do not truly understand them. We can find reasons that we think fit, but there is nothing definitive in what makes these tragedies happen. Aside from that, one of my favorite aspects is how the film seems to juggle the horrifying and the innocent and show that depending on context, they can be one and the same. A young boy plays with a toy bow and arrow and shoots the suction cupped projectile at the window his mother is staring behind. Another scene depicts the mother driving down the road on Halloween while a cheery song plays, but the feelings of lurking malevolence is genuinely unsettling. Lastly, I’d like to touch on the more technical side of things: Tilda Swinton is brilliant. Her handling of being a genuinely hated woman that is perhaps the biggest victim of her son (or is he hers?) is so nuanced and real feeling that it takes on a quiet power without her every having to do a big showy scene. John C. Riley is always a favorite of mine when he’s given the chance to do dramatic roles (though I also find him pretty hilarious), so it was nice seeing him in a film this dark. 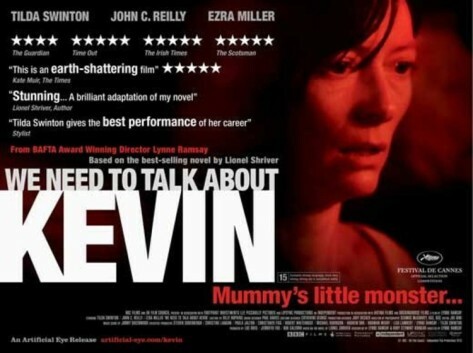 Ezra Miller is positively haunting and infuriating in his performance, and manages to hold his own beside Swinton and carries off being despicable very well. I’m trying to find something I didn’t like about this film and the closest that I can think of is that it’s constantly shifting narrative makes it hard to truly connect with the events of the film sometimes, because you are so quickly swept from moment to moment almost at random. Final word: It’s a great, haunting film that many will find hard to watch, especially under current circumstances. This entry was posted in Drama, Recent Releases. Bookmark the permalink.